Are we maintaining the U.S. Constitution and keeping it where the Lord put it, for the rights and protection of all flesh? This post was taken from the July 2016 Ensign, inside front cover. 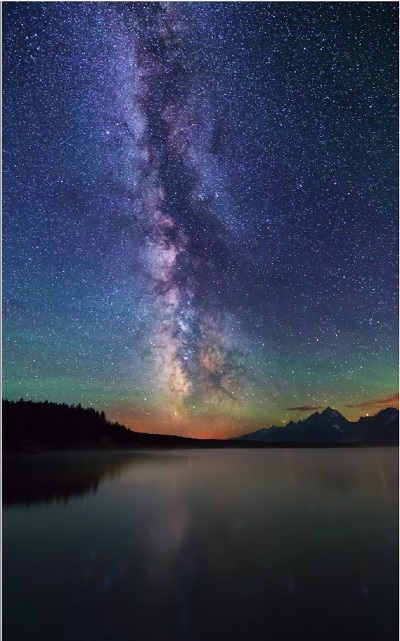 The photograph of the Milky Way was taken from Jackson Lake, Wyoming, USA. All things denote there is a God; yea, even the earth, and all things that are upon the face of it, yea, and its motion, yea, and also all the planets which move in their regular form do witness that there is a Supreme Creator. Creation: By God's hand or by evolution? During more than a decade of blogging, I've discussed evolution with faithful and committed Mormons who believe that the world was created and peopled by the big bang and evolution. So, it seems to me that if God can make stuff without being directly involved, as some people claim, then so can I. In fact, using that approach, I created the building pictured below. It's true. I created this beautiful building. 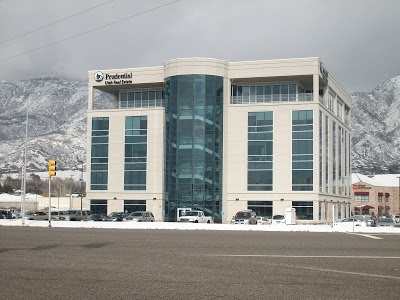 Here's how: Every day for three years, I drove past this street corner on my way to and from work. In the beginning, it was just an empty field. But using a policy of strict non-interference, I checked up on its progress twice a day every Monday through Friday for the entire three years that it was under construction. In other words, I created the above building. Of course, all I really did was watch. But that is exactly what certain LDS evolutionists believe God did. He just stood by quietly and watched, while the big bang and evolution created the world and everything in it. I believe Elder Andersen. I believe it's important to see God's hand in the Creation as well as in our personal lives. According to LDS doctrine, there was no death before the Fall. The creation was paradisiacal. There was no mortality. Death for all forms of life began when Adam fell. During the April 2016 general conference, Dallin H. Oaks affirmed the doctrine of no death before the Fall. He said: "Adam and Eve ... made the choice that introduced mortality." (Ensign, May 2016.) "Introduce" means to bring something into operation for the first time. In the October 1993 general conference, Dallin H. Oaks said: "It was Eve who first transgressed the limits of Eden in order to initiate the conditions of mortality." (Ensign, Nov. 1993.) In this case, "initiate" means to cause something to begin. The English definition of "mortality" is the state of being subject to death. Therefore, according to Dallin H. Oaks, there was no death before the Fall. A Senior Missionary Opportunity A bug in thousands of LDS.org links to scripture Out of Zion shall go forth the law To answer that, here are summary excerpts for the book "Our Lost Constitution"
C neither shall they learn war any more. Apostles and prophets are appointed to teach doctrine and interpret scripture. The Lord tells us (twice) to say "none other things" than that which the apostles and prophets teach (D&C 52:9, 36). The doctrine of The Church of Jesus Christ of Latter-day Saints is not established by a man who never held the apostleship. The doctrine of today's Church is established by living apostles and prophets. Creation: By God's hand or by evolution? Would God putting the Big Bang in motion be enough involvement for you? . Brian T: Perhaps God packed that singularity using immeasurable care, incalculable planning, and incredible foresight. Or maybe President Russell M. Nelson was right when he said: "To me, such theories are unbelievable!" Dallin H. Oaks affirms NDBF Hi Gary. This is Greg, still living 11 years in China. As far as I know, you are the ONLY PERSON performing this service - showing that the correlated teachings of the Church support the Scriptures. I have had time to study the Scientific evidence supporting the twin doctrines of Uniformitarianism and Evolution and have found that it really does not exist, upon careful, critical examination. Yet, all of applicable sciences are now crafted upon these two paradigms and thus, Church schools must submit or their teachers and departments suffer excommunication from the academic communities. My teachers have not come from LDS communities, but, they are excellent. As a trained lawyer, I believe I am qualified to evaluate the validity of the evidence. God bless you on your mission! I know the Scriptures and teachings of the Living Prophets are true! One could also imply "human". "Adam and Eve ... made the choice that introduced [Human] mortality." Otherwise the quote should have been: "Adam and Eve ... made the choice that introduced all life forms to mortality." How's New York treating you? Anonymous: In 1993, Dallin Oaks said: "It was Eve who first transgressed the limits of Eden in order to initiate the conditions of mortality." (Ensign, Nov. 1993.) As used here, "initiate" means to cause something to begin. In 2016, he said: "Adam and Eve ... made the choice that introduced mortality." (Ensign, May 2016.) "Introduce" means to bring something into operation for the first time. The two statements support and clarify each other. The ambiguity you suggest doesn't exist. The Church has no official position on the theory of evolution. Organic evolution, or changes to species’ inherited traits over time, is a matter for scientific study. Nothing has been revealed concerning evolution. Though the details of what happened on earth before Adam and Eve, including how their bodies were created, have not been revealed, our teachings regarding man’s origin are clear and come from revelation. For further reference, see “The Origin of Man,” Improvement Era, Nov. 1909, 78; Ensign, Feb. 2002, 29. See also Encyclopedia of Mormonism, 5 vols. (1992), “Evolution,” 2:478.